Robi 110 Minutes at 43 TK Recharge Offer! Welcome to Robi Customers cans eligible to enjoy Robi 110 Minutes at 43 TK Recharge Offer. 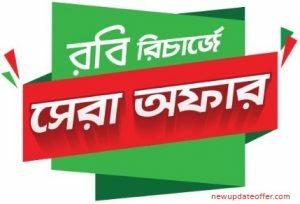 Robi all prepaid and postpaid customers to connection users are eligible to enjoy Robi 110 Minute 43 Taka Recharge offer. If you are Robi customers and looking Robi 110 Minutes Bundle Package Offer, First check the Robi Minutes Pack full detail information and Terms & Conditions. To activate Customers need to recharge BDT 43 TK. Robi prepaid and postpaid customers can this offer. The 43 TK to recharge amount will not be added in customer’s main balance. Robi 110 Minute Bundle Minutes pack can’t be transferred through Robi balance transfer. Customers can use this 110 minutes only Robi to Robi Number. Minutes Uses time 24 hours in a day. Customers need to Dial USSD Code *222*2#. The validity of Robi 110 Minutes @ 43 TK Offer 3 days. To know more details Info about the Robi 110 Minutes Bundle Offer. To Just Call 123 or 01819400400. Thanks for staying with us a long time and visiting Robi 110 Minutes at 43 TK Recharge Offer article. If you have any question or confusion about the Robi 110 Minutes Bundle Offer Pack, We reply as soon as possible with a right answer.